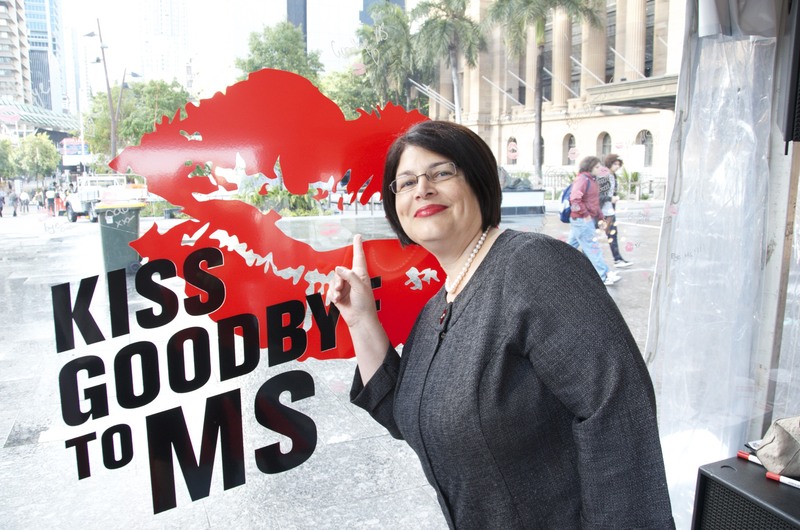 Bright red lips filled King George Square on Monday morning as Queensland’s first MS Awareness Week kicked off. People passing through the square were encouraged to get their lips painted by Academy of Makeup artists and to pucker up to the “Kiss MS Goodbye” wall to show their support. 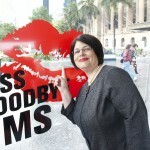 The vibrant red runway carpet, balloons and brightly-clad volunteers contrasted with the rainy day and served to draw more attention to the disease – attention which MS Australia’s Brisbane Director of Services, Karen Quaile said is extremely important. “We help people to understand the disease,” said Mrs Quaile, who joined the society 18 months ago. MS Australia aims to provide physiotherapy, counselling, financial support services, nurses and an information line for the 20,000 Australians with MS, three out of four being women. One of the event’s volunteers, Mare Feldman, said it was devastating when her daughter was diagnosed but that the society does a wonderful job in supporting MS sufferers. “A person can just phone up and ask for help and there is someone to talk to – which is sometimes what they need,” she said. She said people didn’t realise how many people were affected. But today’s event certainly raised awareness – Brisbane MP Grace Grace also attending the launch and encouraging the public to do their bit. Grace Grace – knows the pain of MS.
“I have a brother-in-law that is severely impacted by this terrible disease that inflicts a lot of young women, as we know, but young men as well,” she said. With diagnosis in Australia increasing by 7 percent, Communications Manager Melanie Mead also stressed the importance of early diagnosis. “The thing for me is that women aged 20 to 40 are the prime age and gender of diagnosis,” she said.